The Trump White House plunged deeper into political crisis Thursday, as President Trump and top aides gave conflicting accounts of how and why Trump fired FBI Director James Comey, and FBI and Justice Department officials flatly contradicted the White House version of events. As the Trump administration scrambled to defend the decision to fire Comey, Democrats have seized on the firing to intensify their campaign against Trump, focused not on his right-wing social and economic policies, but on criticism for being insufficiently aggressive against Russia. 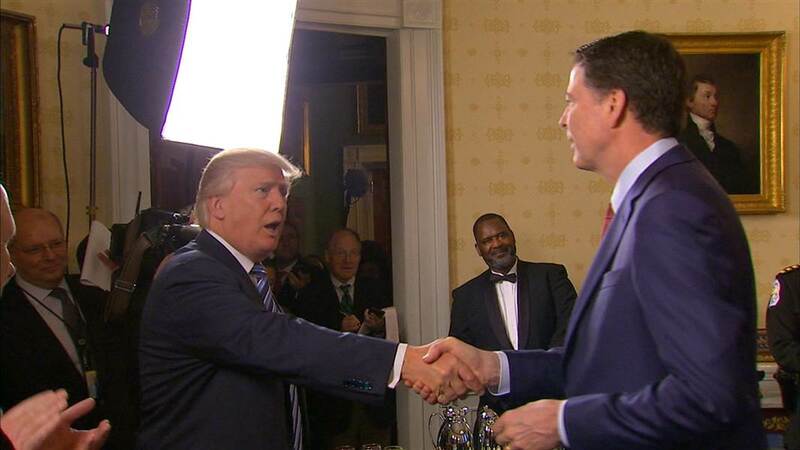 Most remarkable was Trump’s description of what he claimed were three separate conversations with Comey in which the FBI director reassured Trump that he personally was not a target of the FBI investigation into possible collusion between the Trump presidential campaign and Russian intelligence agencies. During this meeting, Trump says he asked whether he was personally a target of the FBI investigation into alleged Russian intervention into the 2016 US elections, and Comey assured him he was not. FBI officials, speaking with the press anonymously, have denied this account, pointing out that to pass such information on to someone involved in an investigation would violate longstanding protocols. The exchange as described by Trump is extraordinary: the president as employer was interviewing Comey as a potential employee, asking to be assured that Comey as policeman was not targeting him for investigation. The implied quid pro quo is obvious: you don’t target me, and I agree to keep you on as FBI director. The allegations of Russian intervention into the 2016 US elections are both completely unsubstantiated and politically motivated. But Trump’s efforts to influence or suppress the FBI investigation could become a basis for impeachment charges. In his interview with NBC, Trump rolled out a new account of how and when he decided to fire Comey, the third or fourth version of the events leading up to Tuesday’s surprise announcement that the FBI director had been removed. Contradicting the accounts given by his own spokeswoman, Sarah Huckabee Sanders, Trump said he had already decided to fire Comey when he met Monday with Attorney General Jeff Sessions and Deputy Attorney General Rod Rosenstein and asked for their recommendation. Regardless of how they responded, “I was going to fire Comey,” he insisted. Huckabee Sanders has already given conflicting accounts of the events leading up to Comey’s firing, after Rosenstein reportedly threatened to resign if the White House did not withdraw its first version, which placed the entire responsibility for firing Comey on Rosenstein and suggested that Trump had merely acted on the recommendations of Justice Department officials. On Thursday morning, the acting director of the FBI, Andrew McCabe, appeared before a hearing of the Senate Intelligence Committee alongside other top US intelligence officials, for a long-scheduled review of supposed threats to US national security. He was asked about the claims by White House aides that Comey had lost the confidence of rank-and-file FBI agents, and he flatly denied it. He praised Comey effusively and pledged the FBI would continue its investigation into alleged Russian intervention in the US elections. On Wednesday, Rosenstein and Sessions were scheduled to interview four possible choices to head the FBI as interim director—in addition to McCabe. All four are career FBI officials, although one is currently serving as head of counterintelligence for the Director of National Intelligence. An interim director does not require Senate confirmation, but would be limited to six months’ service, pending the selection and confirmation of a permanent replacement for Comey. Hearings on the nomination of a new FBI director would undoubtedly become the occasion for further demands from Senate Democrats for the naming of an independent counsel to oversee the investigation into the charges of Russian interference in the US elections. Warner, who had previously opposed such a move, declared that the Senate should refuse to confirm a new FBI director until Trump agreed to the appointment of an independent counsel. The Senate Intelligence Committee has asked the Treasury Department’s Financial Crimes Enforcement Network for financial information on Trump and some of his supporters relating to the Russian investigation. The request was co-signed by Warner and the committee’s Republican chairman, Senator Richard Burr of North Carolina. And the two have invited Comey to appear at a secret session of the committee next Tuesday, in what would be his first occasion to address his firing before an official body, albeit behind closed doors. In another breach in the wall of all-out support for Trump by the congressional Republican leadership, Senate Majority Leader Mitch McConnell acceded Thursday to the demand by Democrats that Deputy Attorney General Rosenstein be invited to brief all 100 senators on the Comey firing at a closed-door session next week. Rosenstein has not yet responded to the invitation. Another top Republican, House Government Oversight Committee Chairman Jason Chaffetz, called for the Justice Department’s inspector general to examine the circumstances surrounding Trump’s decision to fire Comey, sending a letter to Inspector General Michael Horowitz, who is already investigating Comey’s handling of the investigation of Hillary Clinton’s use of a private email server while secretary of state.